It’s in this spirit of becoming that the College has developed its new strategic plan, part of which is to integrate computation, programming, and data science training into its liberal arts curriculum. It’s a response to the clear need for such analytical skills in the 21st century—and the need for greater opportunities for women in STEM fields. Though these new initiatives will bring a more visible tech focus to campus, they do not signal as much of a shift as it might seem. Rather, they formalize what students, faculty, and alumnae have been doing for decades: taking the range of skills, the broad liberal arts foundation, and the critical acumen they’ve developed and charting their own paths in professional environments that demand increasingly sophisticated technological knowledge. When it comes to meeting the challenges of a rapidly changing world, Scripps has always been ahead of the curve. Natalya St. Clair ’06 didn’t consider herself a humanities person in high school. “I loved physics, and I did a lot of math,” she remembers. But she was drawn to the liberal arts focus of Scripps, especially the Core Curriculum. “I got the reading list, and it felt like such a beautiful background for me,” St. Clair says. St. Clair quickly came to see that her two majors were much more similar than she had thought. “There was a degree of creativity in problem solving, thinking in problem spaces in math, and then I’d go into my art classes and I’d almost try to interpret it even further, but more in an abstract, visual way,” she recalls. Artists like Helaman Ferguson inspired her to continue thinking through the ways that problems can be solved through aesthetic and creative exploration. St. Clair taught middle school math for seven years before earning a master’s in technology, information, and education from Harvard University. Now, as a research associate and project coordinator with the Concord Consortium in the Bay Area, St. Clair studies how high school students learn in STEM capacities. 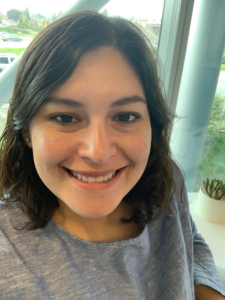 She works with developers, observes students in the classroom, and does outreach to educator researchers, all as part of the larger project of understanding how young learners connect with data. “We know people are really interested in data, but only when it’s personally meaningful to them,” she says. Part of her job is to figure out how to make it meaningful to high school students, including through the development of web-based data science education materials and activities. Vicki Molina-Estolano ’11 attended a large public high school in San Diego, and most of her classmates were UC- and Cal State-bound after graduation—but she wanted something different. “I liked that Scripps had so many different requirements in your first year, so you were exposed to many different disciplines, whereas everywhere else there was this pressure to apply to a certain program right away,” she recalls. That freedom to explore led Molina- Estolano to her Latin American studies major, inspired by a history class she took during her first year. “I’ve always liked history and writing, and by the time I needed to pick a major I had taken a lot of classes on Latin American politics and culture, and it seemed like a good fit,” she says. She planned to go to law school, but while she was working what she thought would be a temporary job at Facebook, life took a turn. “I was doing user support for Latin American users, so a lot of my job was focused on knowing the nuances of Latin American politics and pop cultural references. Beyond speaking Spanish, you really had to be bicultural to do that job well, so it was a perfect fit,” she says. When Facebook’s user support offices moved to Ireland, Molina-Estolano missed California and began looking for a different role. Over the last six years, she’s moved from ad analytics, monitoring the quality of the advertiser experience, to marketing science, using internal data to explain how people use Facebook products. In her current role as a consumer research manager, she helps determine what advertisers need to know about how consumers behave so they can make advertising decisions. In her first role, Molina-Estolano’s skill set was a perfect fit for Facebook’s needs. As her responsibilities have changed, she’s had to pick up more technical knowledge. Facebook offered some training, including learning the programming language SQL, and Molina- Estolano took statistical analysis classes on her own. In her current role, she has to interpret both large data sets and narrative-based market research about user behavior and preferences, but she acknowledges that this kind of hybrid role is more the exception than the norm. There can be as much of a divide between qualitative and quantitative fields in the professional world as in the academic one. “They don’t always know how to talk to each other,” she says. Having a grounding in both is a significant advantage. As the daughter of a wildlife biologist, Heather Phillips ’98 moved around the American West throughout her childhood, following migratory birds along what’s known as the Pacific Flyway. It was an unusual childhood, one that included stints in small towns, rural areas, and even a wildlife refuge. High school in Albuquerque, New Mexico, was her first taste of anything like city life. But the debate team also revealed to Phillips some of the challenges she would face. “At the time, New Mexico felt very conservative and patriarchal to me,” she recalls. “I knew that some of the things I got scolded for were valued in the guys in my class, and that struck me as very wrong.” Her search for a place that would help her to grow in her own way led her first to a community college, and then to Scripps. She credits her grandmother, herself a library technician, with helping her figure out what she was looking for in a school. Once at Scripps, Phillips focused on a political science degree she describes as “feminist political philosophy.” She went on to law school at the College of William & Mary and then spent a year with AmeriCorps, working for the immigration law firm Casa Cornelia in San Diego. Managing the law library there, she saw even more clearly how information was power. “The right piece of information could turn somebody’s asylum case entirely around. It could take the immigration judge from skepticism to agreeability in the snap of a finger,” she says. Her grounding in feminist research methods also helped her know where to look for data— regional nongovernmental organizations like Red Crescent and Doctors Without Borders had access to information the State Department did not, and so did journalists, all of whom could help immigration clients. After that experience, library school at the University of Arizona felt like a natural move; Phillips has been working as a law librarian ever since. As assistant branch librarian for the Ninth Circuit Court of Appeals, she consults on large research projects for judges and their research staff, helping researchers refine search strings and filters, select databases, and work with material that hasn’t been digitized. “Everything isn’t on the internet, it isn’t free, and you still have to know how to find it,” she says. The exchange of information is multidirectional: she also gives feedback to databases about use and effectiveness and negotiates the contracts that make the information available.